A team of archaeologists and students are excavating a site in the Nile Delta region of Egypt where, set within desert desolation, ruins still bespeak an important port city that flourished by the 2nd and 1st centuries B.C. 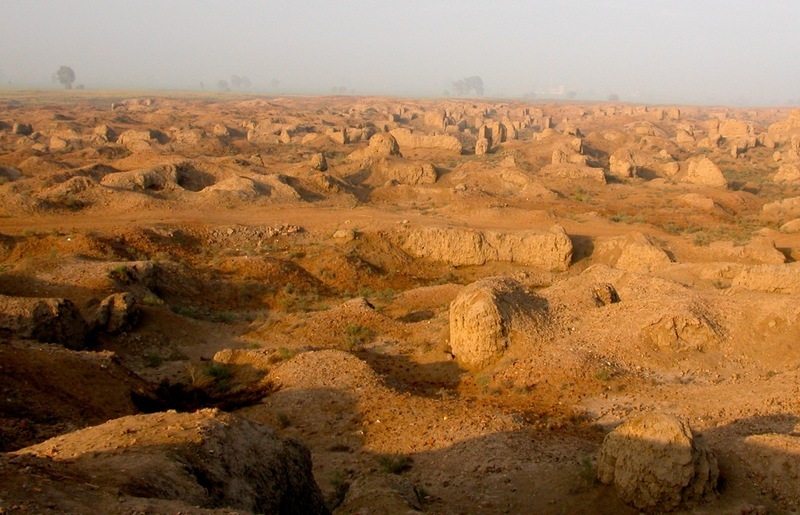 Near the present-day city of El-Mansoura, a clearly human-made rise with visible ruins mark the spot of Tel Timai, what remains of the city of Thmuis, an ancient port city and capital of the Ptolemies. Here, a team of archaeologists and students directed by Professor Robert J. Littman of the University of Hawaii, with co-directors Dr. Jay Silverstein, also of the University of Hawaii, and Dr. Mohamed Kenawi of the Alexandria Center for Hellenistic Studies, are unearthing architectural features and artifacts in several different focus areas: a northern "salvage" sector; an area identified as the East Forum of the city acropolis; and, beginning in December, 2012, a possible Ptolemaic temple. 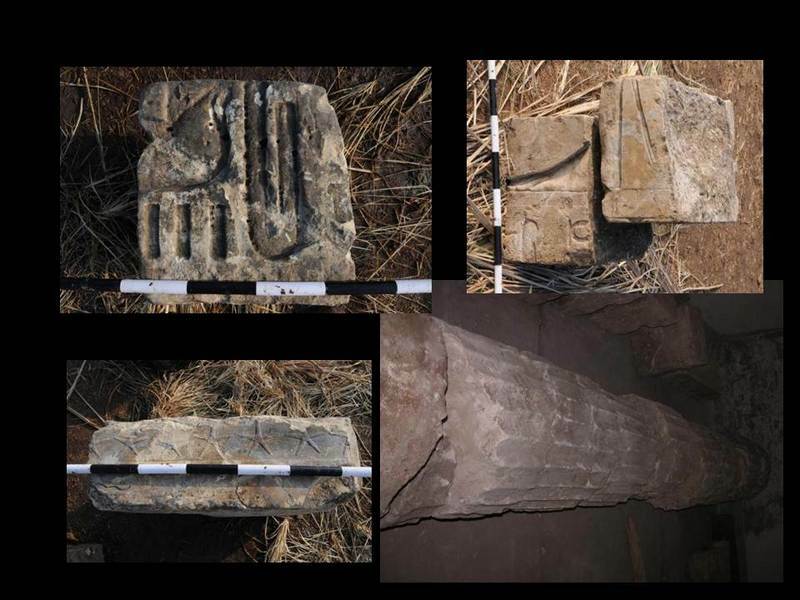 "Little excavation has been done in Tell El-Timai," reports Littman, "but material of significance has been discovered that indicates the potential of the site. It is one of the few places in the Delta region where papyri have been found. At the end of the 19th century Edouard Naville discovered what he labeled as a library in a Roman house. Unfortunately, he did not indicate where on the Tell this was located. The papyri were burned, worse than those from Pompeii, according to Naville. He attempted unsuccessfully to preserve and transport the papyri. Unfortunately, only a few have survived, which are administrative records. A number of marble statues and small bronzes, and magnificent Hellenistic and Roman mosaic floors, now in the Egyptian Museum in Cairo, and the Graeco-Roman Museum in Alexandria, attest to the wealth and importance of the city." The name Thmuis (Egyptian tamAwy or “new land”) was first referenced in the Histories of Herodotus. Having visited Egypt in the middle of the 5th century BC, he enumerated the nomes (districts) from which the military class, called Calasirians, came. Both Mendes (the great nearby ancient city that preceded it as capital) and Thmuis are mentioned, which indicates that both cities flourished independently at this time. Archaeological excavations at Mendes suggest that by the fourth and third centuries BC, the population had diminished considerably. This was paralleled by a rise in the importance of Thmuis, which flourished during Ptolemaic times (4th to 1st century BC) and became the capital of the Mendesian nome. "Thmuis is about a half kilometer south of Tell el Rub’a, the site of the ancient city of Mendes," reports Littman. "Mendes was a dominant city in the Delta during most of Egypt’s history, from the end of the fourth millennium until the fourth century BC, in part because it was an important port. Apparently, the course of the Nile shifted in the fifth and fourth centuries, and Mendes, having lost its economic base as a port, was gradually abandoned for Thmuis, where the course of the river had moved, and where a port had developed." The city itself is mentioned during the period of the Jewish Wars (66-70 AD). Josephus' Jewish Wars relates that the future emperor Titus sailed with his army from near Alexandria via the Nile along the Mendesian nome, and disembarked his army at Thmuis for an overland march to Jerusalem. This indicates a major port at Thmuis. In the 2nd century AD we find Thmuis as the capital of the Mendesian nomes, at a time when Mendesian perfume was the rage in the ancient world, according to Pliny (Natural History). By the fourth century it had become one of the most important cities of Egypt. During Roman times (3rd to 4th century AD) it became an episcopal see and was the home of Saint Serapion (4th century AD). In the sixth century it was a city in the Eparchy of Prima Augusta, and in the 7thcentury it is included among the dioceses of the Eparchy of Augustamnica Prima. Because of its importance as a center of Christianity, many of its bishops are known, including Phileas, martyred in Alexandria in 305 AD, and Anba Mennas in 744 AD. The city was still prominent when the Arabs invaded Egypt in 641 AD. It probably was abandoned by the 10th century AD, after a local tax revolt. Recent exploration and excavation of the city by the University of Hawaii expedition actually began in 2007. In the northern part of the ancient city, the team is working in conjunction with the Supreme Council of Antiquities to conduct salvage operations in a zone that had been stripped to a strata corresponding to the 1st Century BCE in the 1920s and is currently slated to be leveled for modern construction. 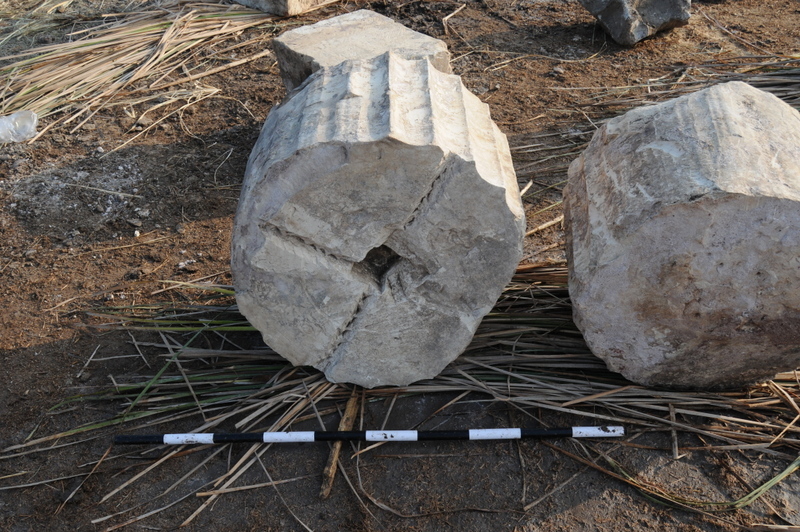 Archaeologists have determined that a destruction event dating to the early 2nd century BCE was followed by the systematic leveling and rebuilding of the area. Ceramics and coins, including a small cache buried under a floor with in situ ceramics suggest that the destruction event occurred during the reign of Ptolemy V and could be associated with the great rebellion discussed in the Rosetta Stone and many other documents. 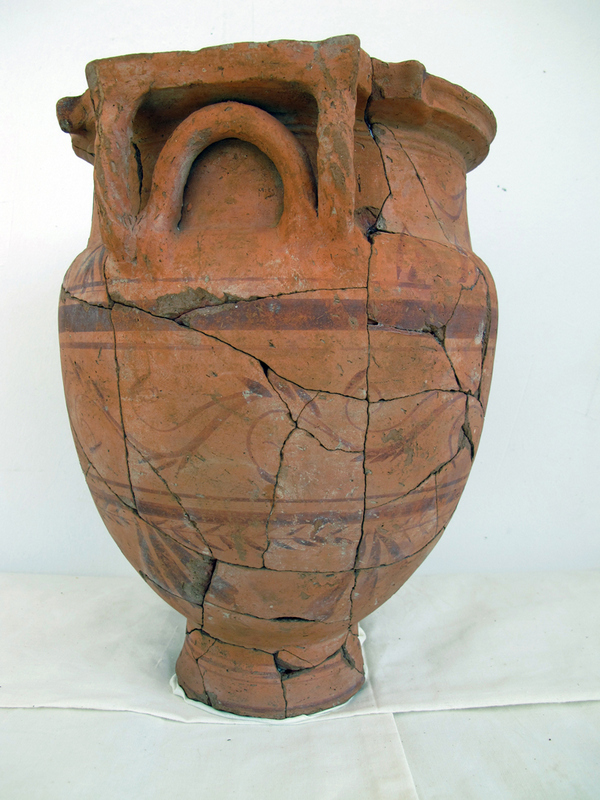 Evidence includes human remains with signs of trauma, ballistae stones, burning, in situ ceramics indicating little warning for abandonment and a radical and planned reuse of the area immediately following the destruction. In one refuse pile a head of a small domestic figure of Ptolemy V was recovered, consistent with the call for domestic shrines to the pharaoh as recorded in the Rosetta Stone. A broken statue of Arsinoë II, deified as Isis, was pulled during salvage and may have come from related strata based on oral reports of the find. 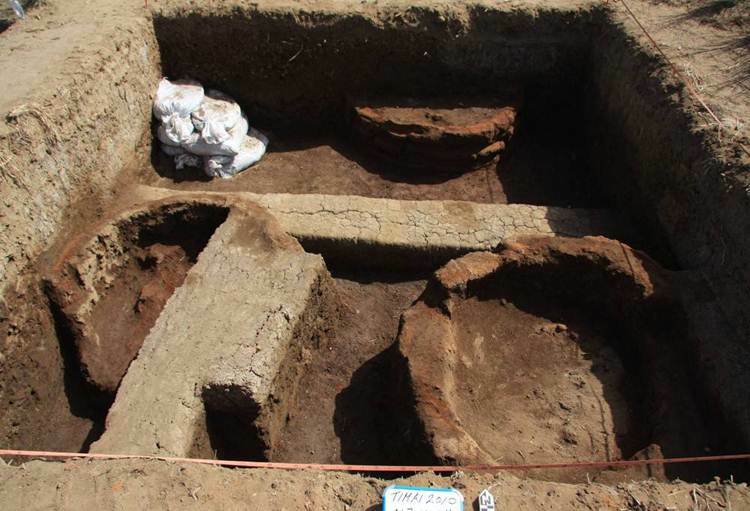 Other discoveries in the north include a possible shrine with an Isis lamp and an extensive kiln complex that predates the arrival of Alexander the Great. The complex was evidently shut down after the destruction event and one body was found in the fill of a truncated and leveled kiln. In the central portion at the East Forum, recent excavations have begun to explore extensive well-preserved mudbrick architecture of what appears to be public buildings. 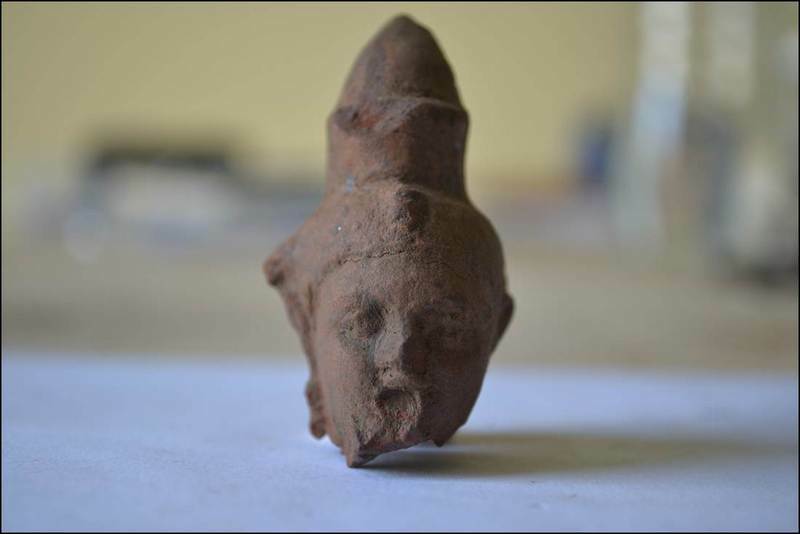 An offering pit in one building has yielded an impressive cache of artifacts, including a set of Sub-Saharan acrobat figurines, miniature ceramics, lead votive charms, and a ceramic statue of the god Bes. This assemblage was found near a large red granite statue pedestal and the earliest artifacts date to the early Roman period. With the support of the National Geographic Society, an additional project area will begin in December 2012 with the objective of exploring the area in the southern portion of Tell Timai, where monumental architectural elements were dredged from a canal. The elements included columns and portions of a wall frieze. A stone found in the adjacent field has a faint inscription that appears to be a cartouche with the name of Ptolemy II or III. This structure may be a temple erected by Ptolemy II for his queen Arsinoe. Work planned in December 2012 includes a geophysical survey and archaeological testing of GPR data.